Here’s what usually comes to mind when I think about police: men, guns, uniforms, violence, corruption, shootings. Viral YouTube videos show cops in riot gear at protests. I think of police on horseback in the French Quarter, telling people what to do from on high. 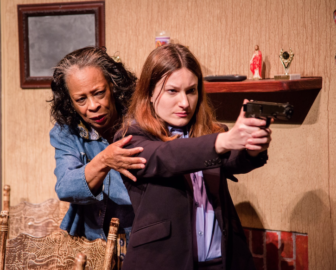 In a scene from \”Black and Blue,\” Carol Sutton plays \”Anne Broussard\” and Maile Zox plays \”Dana Crane,\” NOPD officers of different generations with competing views on policing. But “Black and Blue,” the play inspired by the life of retired New Orleans police officer Yvonne Bechet, touches on very different images and themes: women, family, heart, dedication, community, misgivings, complexity, and tenacity. Images of police with children they adore, having birthdays, making dinners, and mentoring newer police. The play’s final performances are next weekend. Bechet weathered the rampant sexism and racism in (and out of) the NOPD in the late 1960s and ’70s while dedicating herself to solving complex problems in public safety and criminal justice. She stepped into a position that a person with her intersection of identities had never held. She pioneered community-based solutions to crime prevention and built trust with the people she served through the use of education programs, social activities, and relationship-building. In short, Bechet made the police department look good by demonstrating that it is possible to be a cop without ceasing to be a human being. It’s not news that women are cops today and that officers have families that may bring out their tender side. The message of “Black and Blue” is that Bechet’s identity as a black woman with a beloved family was fundamental to the approach to police work that she pursued. Family members and long-time friends filled the audience at the performance I saw, as did donors, and the NOPD officers who partnered with Bechet, playwright Ariadne Blayde and Mathew Schwarzman, the play’s producer. After the curtain came down, we all sang “Happy Birthday” to celebrate Bechet turning 84. Bechet’s legacy was felt not only in the trail-blazing story of her career, but in the play’s power to make an audience understand the complexity of the relationship between police and community in New Orleans. Bechet and Schwarzman commissioned Blayde to put Bechet’s career at the center of a broader narrative about police/community relations and race. But what if I had been a black kid, caught using marijuana instead of beer, and about 10 blocks closer to Louisiana Avenue? The first act takes place in the late ‘60s when Bechet was hired by the NOPD; the second jumps to contemporary events, though Bechet actually retired from the force in 1990. This lets the audience wrestle with the very recent controversies surrounding the deaths of young black men — Trayvon Martin, Philando Castile, Michael Brown, Alton Sterling — as well as the legacy of the New Orleans Police Department’s deadly performance in the aftermath of Hurricane Katrina. 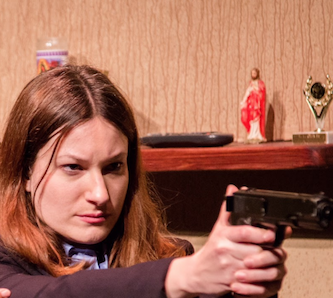 By focusing the narrative on black officers, rather than vilifying only the whites implicated in shootings by police, the play forces the audience to reconsider the binary thinking in current community attitudes toward law enforcement. “I think the play really highlighted the ‘us vs. them’ mentality. It was really great to be reminded that not all officers see ‘us vs. them,’” Alison McCrary, executive director of the National Police Accountability Project, commented after the play during a discussion joined by audience members and the cast. Another powerful choice was to double-cast characters with sometimes opposing points of view: Anne, the character based on Bechet, is played in the first act by Cherelle Palmer who, in the second, plays Patricia, the working mother of a boy who gets shot by police. The double-casting emphasizes how black motherhood makes Anne’s and Patricia’s points of view almost identical — while policing puts them on opposite sides of a social divide. When asked if the play had changed her attitude towards police, Palmer told a story about being stopped on her way to work by two cops at 5 a.m. on a cold morning in December. The discussion was facilitated by Bechet’s daughter-in-law, Troi Bechet, the founder and head of the Center for Restorative Approaches. My own experience of being policed is minimal. My parents didn’t worry that I would be shot or killed if I came in contact with the law. The fear they had was that getting in trouble with the law could jeopardize my college options. I am white, I grew up in the 1990s in a predominantly white and Asian-American neighborhood in Metairie, and I went to school in uptown New Orleans. My first significant interaction with the NOPD happened freshman year in high school, when a policeman found me in the Garden District on Mardi Gras day with a beer in my hand. I was about 4-feet, 11-inches tall, weighed 90 pounds, and there was no way to believe I was of legal drinking age. The cop rolled his eyes and brought me (no handcuffs) to sit on a drink cooler near his family, a few blocks up the parade route, while he called my parents to pick me up. He pointed to his daughter, about my age, and noted that she was having a fine time during Mardi Gras without alcohol. My dad arrived, stressed and angry at having to negotiate Mardi Gras road closures. I got in the car and cried all the way home. The cop had thoroughly schooled me, without using violence or intimidation to make his point. But what if I had been a black kid, caught using marijuana instead of beer, and about 10 blocks closer to Louisiana Avenue? How differently could this heartwarming coming-of-age moment have ended in a city where 96 percent of young people arrested in 2016 were African American? The audience discussion also touched on the erosion of confidence in law enforcement due to reports of police corruption and the acquittal of officers involved in fatal shootings. “What diminishes trust in our communities is when you have a video of an officer point-blank killing a young black man and there’s no accountability, criminally or civilly,” McCrary pointed out. Her organization, along with Court Watch NOLA, the New Orleans Community-Police Mediation Program, and the Office of Independent Police Monitor, are among groups dedicated to greater accountability by police, prosecutors and judges. Hopefully, the politicians are listening. “Black and Blue” is playing through Sunday, January 28th at Dillard University’s Cook Theater, 2601 Gentilly Blvd. Show times are Friday and Saturday at 7:30 and Sunday at 3. Ticketing info available. Cara Romanik is an educator, playwright and community organizer. After 17 years away, she is proud to be celebrating her first year back in New Orleans, her hometown. Views expressed in the Opinion section are not necessarily those of The Lens or its staff. To propose an idea for a column, contact Lens founder Karen Gadbois.